You’re probably aware that one of the best ways to ensure that you stay in reasonably good health is to follow a well balanced diet. But what does this actually mean, and what does it entail? 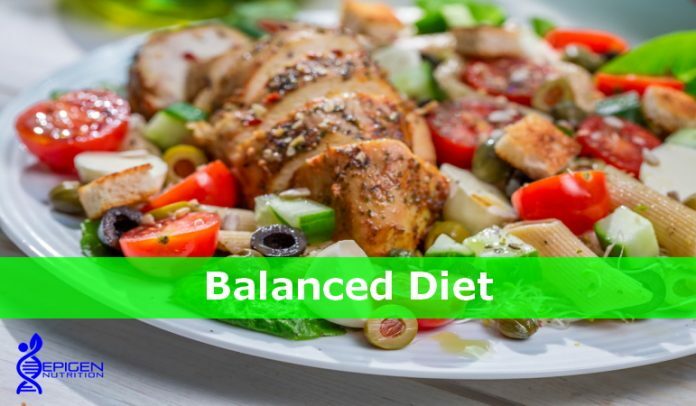 Following a healthy balanced diet simply requires that you eat your meals from all of the main food groups in just the right proportions, while making sure of avoiding foods that contain undesirable nutrients like sugar, saturated fats, and sodium. Be aware though, that everyone’s bodies are very different, so we can’t all follow the same diet. Depending on what gender you are, your age, and any possible illness you may be suffering from, you may require different amounts and types of certain nutrients. But, in order for you to start working towards maintaining good health, you will need to make a few dietary changes, or even adopt new eating habits altogether. >You have to reduce your salt intake, so that it doesn’t exceed 6 grams a day. > If you’ve never paid attention to how much salt you sprinkle over your food, then you might be a bit surprised when you find out how little 6 grams is compared to how much people are used to consuming every day. > Cut right down on saturated fat and sugar intake, as they are both very dangerous to your health. > Aim to drink about six to eight glasses of water every day. If you’re used to drinking more soft drinks than water throughout the day so need a varied taste, try squeezing a few drops of lemon in your glass to add a bit more flavour. > Try to eat two portions, or a bit more if it’s possible of fish every week. Most fish are incredibly nutritious. And if you can, go for the oily ones like, Mackerel, Trout, Tuna or Salmon. > Try not to skip breakfast! You’ve probably heard that breakfast is the most important meal of the day about a million times, you should really listen to that piece of advice. Eating a nutritious breakfast will provide you with the energy you need to make it through the rest of the day. (unless you happen to be following an intermittent fasting diet, then you can delay the breakfast for a couple of hours – but consult with your doctor first). > Each day try to eat five or more portions of fruit and veg, with more emphasis on the veg if you can. Not a lot of people actually manage to do this on a daily basis. However, if you want to live healthier, you will need to start including more fruits and vegetables into your diet. In order that your tissues and organs can work properly, they need to have proper nutrition, and eating a varied balanced diet is the best way for them to get it. When you don’t eat properly, you’re more likely to get infections, develop diseases, and experience bouts of fatigue. If you’re a parent, it is your duty to make sure that your children maintain a balanced diet, as insufficient nutrients can lead to developmental and growth problems. Plus you might want to also take into consideration that bad eating habits you develop during childhood can be incredibly hard to change later on in life. The constant rise of diabetes and obesity around the world, should serve as a wake-up call to all of the people who don’t really pay attention to their poor eating habits. Be aware that some of the deadliest diseases we have today, such as stroke, cancer, heart disease, and diabetes have shown to be all linked to poor nutrition. If you’re tired of constantly getting sick or simply don’t know what to do to start feeling more energized throughout the day, then chances are that you simply need to start eating healthier. Rick Freeman is a Certified Nutritional Therapist and Advanced Dietary Supplements Advisor. International Institute for Complementary Therapists (IICT) approved, CPD accredited and YMCA awards endorsed. Health coach, health and fitness enthusiast. And a husband and father of 2 beautiful daughters. My mission is to help people to take control of their health and well-being by following a healthy enjoyable lifestyle, that not only gives them the body they’ve always wanted, but helps towards living a longer, happier, disease free life. Can You Stick to a Reduced Sugar Diet When You Eat Out? Why are Carbohydrates Important to Us? Is Your Diet Causing Digestive Problems? Here at Epigen Nutrition we are passionate about helping to improve peoples overall wellness through science based nutrition. The content on this website is intended for informational and educational purposes only. You must consult your doctor or medical practitioner for any medical advice, treatment or diagnosis that you require.